Includes all 13 episodes of Season 2 and over 2 hours of all new, never-before-seen extras! 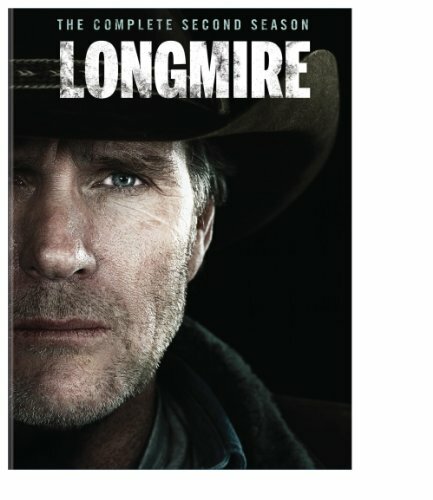 BURBANK, CA (March 13, 2014) - Big Sky drama from Absaroka County, Wyoming is back as Season Two of Longmire is released for the first time on DVD. In the show's second season, everyone's courage is tested, and how they face their challenges will define them. Timed to the Season Three premiere on A&E this summer, Warner Bros. Home Entertainment will release the contemporary western Longmire: The Complete Second Season on May 13, 2014, being priced to own at $39.98 SRP. Season Two finds reluctant hero Sheriff Walt Longmire back in the saddle after coming to terms with the devastating loss of his wife. But a storm is brewing. As he fights for re-election against his own deputy, Branch Connally, his right-hand deputy Vic Moretti is haunted by a past she'd rather forget. At the same time, Walt's daughter Cady searches for answers about her mother's murder, and Walt's possible connection to the death of his wife's killer threatens to sweep his loyal friend Henry Standing Bear into the mix! "Longmire was A&E's most-watched scripted series in the network's history with M25-54 viewership rising +23% vs. the prior season*," said Rosemary Markson, Senior Vice President, TV and Special Interest Marketing of Warner Bros Home Entertainment. "We are very excited to release Longmire: The Complete Second Season on DVD just in time for the numerous fans to relive the excitement before the next season." Based on the "Walt Longmire" mystery novels written by best-selling author Craig Johnson, Longmire is executive produced by Greer Shephard (The Closer, Major Crimes, Nip Tuck), Michael M. Robin (The Closer, Major Crimes, Nip Tuck), Hunt Baldwin (The Closer), and John Coveny (The Closer). Starring Robert Taylor, Katee Sackhoff, Lou Diamond Phillips, Bailey Chase, Cassidy Freeman and Adam Bartley, the hit drama is produced by The Shephard/Robin Company in association with Warner Horizon Television. Longmire adeptly captures from episode to episode the subtlety of what it means when a man is challenged to be consistent in his ideal. A unique piece of entertainment that calls to attention one of the over arcing themes of Season 2. Can Walt Longmire survive his test of courage?